I can’t believe our 12 Days of Blogmas is coming to end! It’s been a fabulous 12 days of so much Christmas goodness and I’m going to miss talking about all things Christmas here in the blog. But alas, it’s time to go back to travel and healthy living…with a few cupcakes thrown in for good measure! But before we head back to regular content it’s time for a holiday blog linkup and to announce the giveaway winner. Our giveaway winner is….Valerie Hall…congratulations!!! The holiday blog linkup is a chance for us to see all of the fabulous Christmas goodness you’ve been posting on your blogs! So link up your favorite holiday post from this year…or your best post from the past…and then take a minute to explore all of the Christmas awesome-ness! My favorite Christmas post this year was of course the 12 Days of Cupcakes…because you can never have too many cupcakes! Tis the season for holiday parties filled with calorie laden foods and drinks and a calendar so packed it might be difficult to make it to the gym. So how do you stay healthy during the holidays…with these healthy holiday tips! Choose your indulgences carefully…if you’re obsessed with Aunt Rosa’s cookies, then skip the ones you only kind of like from your other relatives…don’t indulge on everything available! Practice portion control – It’s okay to eat one treat at your work Christmas party, but you probably don’t need to eat ten of them! Plate your food…If you’re at a holiday party don’t spend the whole evening grazing at the buffet table. Grazing means you’ll end up eating way more than you should! Instead, prepare a plate of food and then stick to that! Bring healthy food…If you’re attending potluck holiday events, bring along a reasonably healthy dish. This way you’ll know there is at least one healthy option to choose from at dinner time. Ask any member of my family and they’ll tell you…I LOVE traditions! Some of them might even tell you I’m a little obsessed. I think a big part of why I love traditions is that I love adventures, being on the move, trying new things, and going new places and having traditions to come back to centers me and gives me peace. Some of my most favorite traditions happen during the Christmas season and while I could talk about so many of my favorite Christmas traditions, today I’m focusing on holiday decor. Here are a few of my favorite holiday decor traditions and tips on creating your own! Add a new piece each year. One of the things I love about my mom’s house at Christmas is looking back through the years at all of our holiday pictures. Each year my mom gets a new snowman picture frame and adds a Christmas picture from the year. Not everyone needs to get a new picture frame each year (although it is a pretty great idea!) but find something about your decor you can add to each year. Plenty of our decorations are store bought, but there is also something memorable about creating your own decorations. I think one of my favorite reasons for creating your own holiday decor is that each year when you set out the decorations, you’ll be reminded of the memories you made creating the decor. Every time I put out my holiday garland I’m transported back to the year I made this at my mom’s house. Do you have any holiday decor traditions in your family? See more ‘Holiday Decor’ posts from the Blogmas bloggers! Today we’re talking all about baking for the 12 Days of Blogmas! But let’s be real for a moment…if I’m going to talk about baking is there anything I would talk about other than cupcakes?!? We’re again combining two things I absolutely adore…Christmas and cupcakes for….Christmas cupcakes! So today we celebrate the 12 Days of Christmas Cupcakes! What is your favorite treat to bake at Christmas?!? See more holiday baking from the Blogmas bloggers! It’s time for Day Three of the 12 Days of Blogmas! 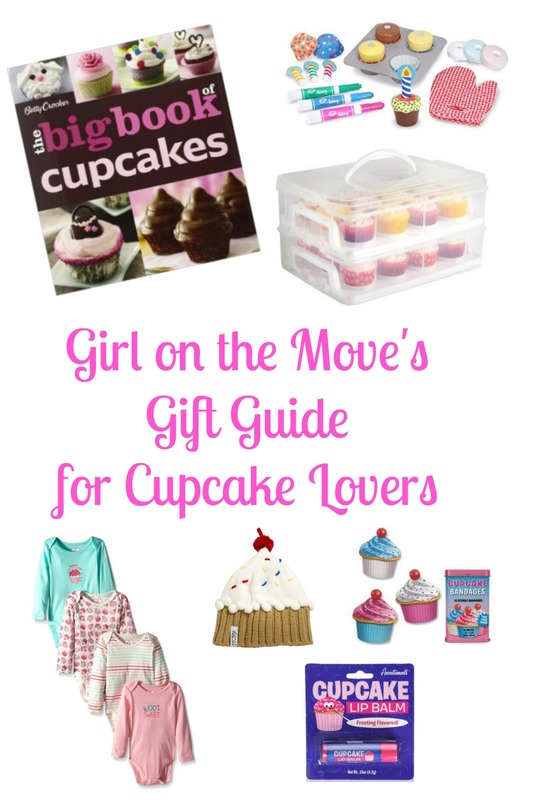 and today I’m sharing a gift guide that is near and dear to my heart…it’s a cupcake gift guide filled with goodies the cupcake lover in your life will love! And if you don’t have a cupcake lover in your life, feel free to pop one, or more, of these goodies under my Christmas tree! The Betty Crocker The Big Book of Cupcakes (Betty Crocker Big Book) – 175 cupcake recipes people…that’s like a new cupcake every other day of the year!!! Melissa & Doug Bake and Decorate Cupcake Set – Because let’s be honest, it’s never too early to brainwash teach the children in your life all about the excellence that is cupcakes…and Melissa & Doug toys are some of my faves! VonShef Snap and Stack Cupcake Storage Carrier 2 Tier – Store up to 24 Cupcakes or 2 Large Cakes – I have three of these and let me just say, they are GENIUS! If you’ve ever needed to transport cupcakes, you need these stackable containers in your life…trust me on this! The Children’s Place Baby-Girls G Cupcake Bodysuits Pack of 4,Iced Mint,9-12 Months – I don’t have any children but when I do, you can bet I’d have a few of these for my daughter…but in the meantime they’re great for nieces and any other baby girls you know! Accoutrements Cupcake Bandages – Because who wants a plain old band-aid when you can have a cupcake band-aid?!? Cupcake Lip Balm Frosting Dessert Flavored Scented Novelty Gift – Take the flavor of cupcakes with you all day…without having to run further to burn off all of the calories from eating too many cupcakes! A few other things you should know…we’re giving away lots of prizes…like nearly $1000 worth so you’ll want to head over to day one to enter! See more Gift Guides from the 12 Days of Blogmas bloggers!